Indian Cobra (Naja naja) or Spectacled Cobra is a species of the genus Naja found in the Indian subcontinent and a member of the "big four", the four species which inflict the most snakebites in India. This snake is revered in Indian mythology and culture, and is often seen with snake charmers. It is now protected in India under the Indian Wildlife Protection Act (1972). The Indian cobra is native to the Indian subcontinent which includes present day Pakistan, India, Bangladesh and Sri Lanka. It can be found in plains, jungles, open fields and the regions heavily populated by people. The spectacled cobra is much respected and feared, and even has its own place in Hindu mythology as a powerful deity. The Hindu god Shiva is often depicted with a protective cobra coiled around his neck. Vishnu, the preserver of the universe, is usually portrayed as reclining on the coiled body of Sheshnag, the Preeminent Serpent, a giant snake deity with multiple cobra heads. 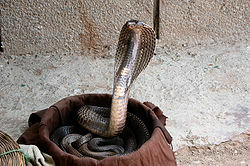 Cobras are also worshipped during the Hindu festival of Nag Panchami. 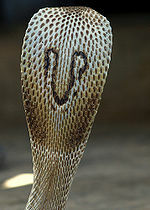 The Indian cobra's celebrity comes from its popularity as a snake of choice for snake charmers. The cobra's dramatic threat posture makes for a unique spectacle as it appears to sway to the tune of a snake charmer's flute. Snake charmers with their cobras in a wicker basket are a common sight in many parts of India only during the Nag Panchami festival. The cobra is deaf to the snake charmer's pipe, but follows the visual cue of the moving pipe and it can sense the ground vibrations from the snake charmer's tapping. In the past Indian snake charmers also conducted cobra and mongoose fights. These gory fight shows, in which the snake was usually killed, are now illegal. Nāg Panchamī (Devanagari|: नाग पंचमी) is a festival during which religious Hindus in some parts of India worship either images of or live Nāgas (cobras) on the fifth day after Amavasya of the month of Shraavana. Traditionally, married young women visit their premarital households to celebrate the festival. Especially in villages in India, a traditional aspect of the celebration involves joyous swinging by young women on swings temporarily hung on tree branches. According to Puranic scriptures, Brahma’s son Kashyapa had four wives. The “first” wife gave birth to Devas; the second, to Garudas; the third --named Kadroo--, to Nāgas; and the fourth, to Daityas. Nāgas were the rulers of Pātāl-Loka. According to the scriptures, Lord Krishna had conquered Naga Kālia and put an end to his evil deeds on Nāga Panchamī. It is believed that the Kathmandu valley used to be a vast lake. When human beings started to drain the lake to make space for settlements, Nagas became enraged. To protect themselves against the wrath of Nagas, people gave the latter certain areas as pilgrimage destinations, restoring thus harmony in nature. According to other scriptures, a king used his Tantric powers to force Nagas to return to the land rains which they had taken away. The Nagas gave in to the king’s Tantric power, but in recognition of their power to control rains, the king established Naga Panchami festival. During the festival, Nepalese traditionally post pictures of Nagas above the doors of their homes to ward off evil spirits, offer prayers to Nagas, and place food items such as milk and honey in their fields for Nagas. A few men wearing demon masks dance in the streets as a part of a ritual. Hindus in Nepal have their own legends surrounding Nagas, which lead them to celebrate Nāga Panchamī on a large scale. 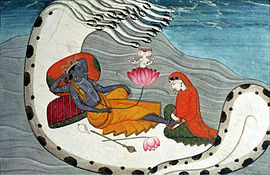 Vishnu resting on Ananta-Shesha, with Lakshmi massaging His "lotus feet." In Hindu (Vedic) tradition, Shesha (शेष) or Sheshanaag (Shesha the Naga) (शेषनाग) or Adishesha (आदिशेष) is the king of all nagas, one of the primal beings of creation, and according to the Bhagavata Purana, an Avatar of the Supreme God known as Sankarshan. In the Puranas, Shesha is said to hold all the planets of the Universe on his hoods and to constantly sing the glories of Vishnu from all his mouths. He is sometimes referred to as Ananta Shesha which means endless Shesha or as Adishesha which means the first Shesha. It is said that when Adishesha uncoils, time moves forward and creation takes place. When he coils back, the universe ceases to exist. "Shesha" also means remainder: that which remains when all else ceases to exist. A dasa (servant) and also a manifestation of Lord Vishnu, he is said to have manifested in four human forms or Avatars: Lakshman, brother of Lord Ram, Balaram, brother of Lord Krishna, Ramanuj and Manavala Mamunigal. Maharishi Patanjali the major compiler of yogic traditions is also considered to be an incarnation of the great Shesha. As per the Mahabharata, Sesha was born to sage Kashyapa and his wife Kadru. Kadru gave birth to a thousand snakes, of which Sesha was the eldest. After Sesha were born Vasuki, Airavata and Takshaka, in order. A lot of Sesha’s brothers were cruel in nature and were bent upon inflicting harm on others. They were even unkind to Garuda, who was Kashyapa’s son through Vinatha, sister of Kadru. (Kadru and Vinatha were daughters of Daksha). Sesha, disgusted by the cruel acts of his brothers, left his mother and kin, and took to austere penances. He lived on air, and meditated in various places including Gandhamadhana, Badrikāshrama, Gokarna, Pushkara and Himalayas. His penances were so severe that his flesh, skin and muscles dried up and merged with his frame. Brahma, convinced of his Sesha's will, asked Sesha to request a boon. Sesha asked that he be able to keep his mind under control so that he could continue to perform ascetic penances. Brahma gladly accepted the request. Brahma then asked a favour of Sesha – to go beneath the unstable earth and stabilize it. Sesha agreed and went to the netherworld, and stabilized her with his hood. He is known to support her even today, thus making Patala his perennial residence. Nairs, the indigenous inhabitants of Kerala State are one of the nagavanshi kshatriya clans in India. The name of the capital city of Kerala State itself is one of the pointing evidence. The name of the city is Thiruvananthapuram (Thiru-Anantha-Puram), which is derived from The Great Anantha Naga who is also known as Great Serpent Adishesha (see Shesh Naag above). This page was last modified on 6 February 2012, at 20:54.